This is Boy George, no not the singer from the eighties with Culture Club. This Boy George is our Cardinal Lory(Latin name:Nibbilus on the Earlobe Maximus).his time out is spent with me in the afternoon when Susan is feeding the other parrots and I'm doing some computer time. 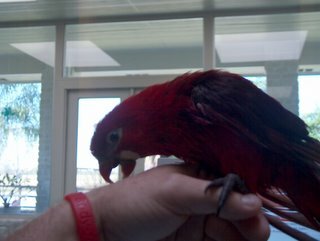 He's a little pest and is viscous towards the other macaws.He attacks anything shiney andloves to hop on the keyboard while I type. After he gets worn out he sits on my shoulder and nibbles at the back of my ear.As you can see he's no bigger than my hand, but what he lacks in size he makes up for in his antics.He is fed nectar and fruit, and will sometimes eat pellets. The bad thing about all lories is that they squirt when they poo, so they can be very messy. Well that show cases another one of our children for the week. Now to the serious stuff. Incline 1 arm Curl:35 lbs, 3rd set dropped to 30 lbs for 12 reps. So there you have it, it was a great workout and I'm looking forward to getting those weights up as the reps decrease. Eating has been on plan so far, and last night I made the EFL chicken minestrone and it was excellent.I even had it again for lunch today. And forgive me for the spelling, Boy George has been all over this keyboard lol. Hey, you got the picture working! Pretty bird... I am fascinated by birds, have been for about 5-6 years now, ever since I met my grandmother's (now my Aunt's) African Grey parrot. She's so funny, and she yells at the cats in my aunts voice, which totally freaks them out, lol.